Since the earliest days of the publicly-accessible internet, there’s been a continual race to increase the speed of our home machines’ connection to the net. Back in the day, we plodded along with 300 baud modems. In today’s terms, that’s a speed of 0.3Kbps, or a mere 30 bytes a second. Today’s modems are much faster, reaching speeds of up to 56,000 baud—much more commonly stated as 56Kbps (kilobits per second). That’s over 185 times as fast. Unfortunately, during that same time, it seems the amount of data we need to download from the web has increased by something like 185,000 times, as even a fast modem can feel painfully slow when downloading large files. For example, Apple’s OS X 10.4.8 Combo Update (Intel) weighs in at a hefty 294MB in size. Download that at max speed on your 56Kbps modem, and you’re still looking at over 12 hours in download time—yikes! Enter high speed internet connections, otherwise known as broadband. Going well beyond a modem’s maximum potential speed, broadband connections ease all aspects of working on the net—downloads of system updates, songs and movies from the iTunes Music Store, and uploads of images and other files to public websites all go much faster than they would using a modem. Presently, there are two dominant broadband technologies: digital subscriber lines (DSL) and cable modem connections. Both have their strengths and weaknesses, but both offer much higher speeds than those available via modem. In my area, DSL speeds can reach 3Mbps (megabits per second), and cable goes up to 8Mbps. To put those figures in perspective, that same 294MB OS X update would take just over 13 minutes to download via DSL, or just under five minutes on the faster cable modem connection. Wow. There’s a third technology that’s just starting to gain a foothold here in the United States: Fiber to the premises, or FTTP. As its name implies, FTTP involves laying a network of fiber optic cabling, connected directly to individual homes. 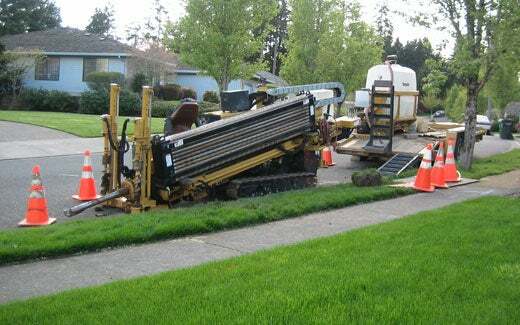 As with the early days of cable, this requires a huge investment in equipment—neighborhood streets must be dug up and miles and miles of conduit and fiber optic wiring installed. Thus far, in the United States at least, there is only one major player working on FTTP on a nationwide basis: Verizon. Verizon has named their FTTP product FIOS, which stands for Fiber Optic Service, and is also the Irish word for knowledge. FIOS takes high speed connectivity to the next level, bringing connections that are both faster and cheaper than cable modems or DSL (more on that in a bit). As someone who has always been interested in the latest and greatest in terms of net connection technologies, I signed up for FIOS as soon as I received word that it was ready to go in our neighborhood. The fact that it was cheaper than our cable modem was just icing on the cake. The installation is somewhat complex, with three crews showing up over two days to accomplish the job. And despite the fact that fiber optic cables are incredibly thin, the FIOS cable is anything but, as you can see in the image at right—you could run 10 cable TV cables inside that sheath. One thing they don’t tell you about FIOS is that when you sign up, you also agree to switch your phone service off the old copper lines. This is part of Verizon’s strategy to get as many customers as possible off of the old copper phone lines—probably to offer us interesting (and not free, of course) services in the future. I was a bit uncomfortable with this change, as it means that your phones are no longer usable in the event of a power failure. To alleviate those concerns, Verizon installs a battergy backup unit that will power your phones for a few hours in the event of a power failure. So just how fast is FIOS? Verizon offers three consumer speed ranges: all offer 2Mbps upload speeds, and download speeds of 5Mbps, 15Mbps, or 30Mbps. As we already had an 8Mbps cable modem, I chose the 15MBps package, doubling my download speed, tripling my upload speed, and saving $10 per month over cable in the process! With FIOS, I can theoretically download that 294MB OS X 10.4.8 update in just two minutes and 37 seconds! As you probably know, achieving the maximum speed on any connection depends on a number of factors, including the bandwidth available at the host, and you seldom see a download at the max speed of your connection. But just as a demonstration of how well FIOS works with a fast server, here’s a real-time movie of a 40MB download at near top speed: here. With super-fast downloads like this—23 seconds for 40MB—buying movies from the iTunes Music Store no longer means tying up your net connection for hours while the movie downloads. And that’s why FIOS/FTTP is really important. It’s not so much about what it means for today. It’s all about what it will allow in the future. As more homes gain broadband connections, we’ll begin to see more and more services designed to take advantage of those speeds. There’s lots of excess capacity in the FIOS system, too, as shown by the availability of the 30Mbps package (for those willing to pya $180 a month!). FIOS should also help everyone, even if the technology isn’t yet available in your area. With pricing below that of cable, and yet with higher connection speeds, the cable providers should feel compelled to increase their speeds while maintaining or lowering their pricing. This trend may start slowly, as FIOS isn’t a very large competitor yet. But assuming Verizon continues their rollout plans, FIOS should evolve into a market leader that will affect pricing of the other broadband services. As software gets larger and more complex, downloads continue to swell in size—the recent World of Warcraft demo, for instance, is 2.92 gigabytes in size. If I could hit the World of Warcraft servers at full speed, that should only take about 30 minutes to download. Unfortunately, the realities of the net are such that I saw an estimate of about three hours for the full download (I canceled at that point, so I don’t know how long it really would have taken). If you’re trying to grab this demo via a modem, well, you really shouldn’t! Beyond downloads, of course, there’s the ever-increasing amount of audio and video content on the web. Apple’s site is full of movie trailers, many of which exceed 150MB in size. Movies purchased at the iTunes Music Store are 1GB in size. System updates. Photos from friends. Movies posted to personal websites. Streaming video from sports and news sites. Everywhere you go, it seems that video and audio are supplementing the web’s traditional use of text and still images. Regardless of whether or not your area presently has FIOS available or not, one thing is certain: the future of internet connectivity lies in broadband, not modems.